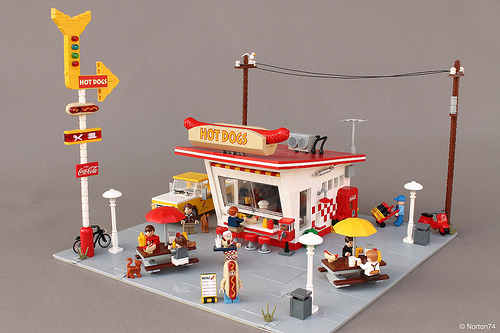 If you have ever tried to imagine where the Collectible Minifig Series 13’s Hot Dog Guy would feel most at home, wonder no more as Andrea Lattanzio has captured a rare glimpse of him in his natural habitat. He looks pleased as a pickle surrounded by grazing minifigs scarfing down delicious hot dogs at perfect picnic tables, while the local cat sniffs hungrily for food. I love the tall arrowed sign and the giant hot dog on the roof. Take a moment to appreciate all the small details that all add up to a great little scene; the gumball machine, soft-drink dispenser and delivery guy to name but a few. 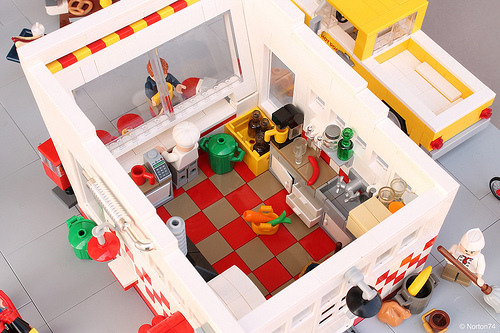 Inside, the fry-chef is hard at work preparing sumptuous treats as his delivery guy dashes delectable dogs out to eager diners. The air conditioning unit on the roof and piles of refuse at the back door being tidied by the diligent worker all help add to the atmosphere of this delightful little scene. 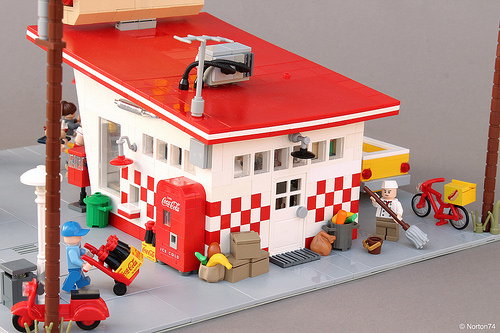 This model is the exact reason I am so passionate about #LEGO! Amazing! Had to show the whole family (who agreed). Outsanding work!